When I started Facing East a year and a half ago, the project felt ambitious. A large quilt. A large paper pieced quilt. 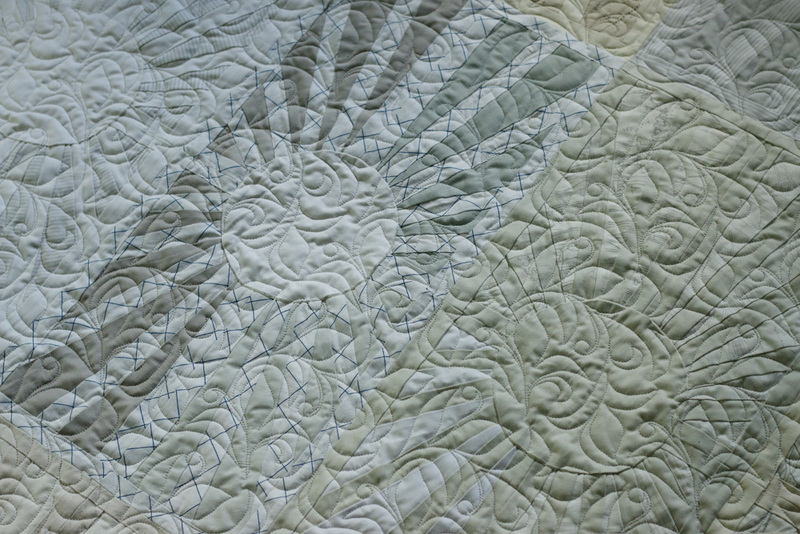 A large, paper pieced, neutral quilt. I knew the process would be long and at times tedious, but I had no idea just how daunting it would prove. It's not that I didn't know if I would like it or if I could do it or if it was worth it. It was that it went so slowly that I never felt I was making progress. Like swimming against the current, I was working hard but never seemed to move. The turning point was earlier this year, when I realized I needed help. I needed structure. The Big Bed Quilt-Along provided that for me. It helped me envision a finite end date, even if it was three months away! The quilt-along also got me to commit to a precise block count and a border plan, both of which boosted my energies. My finished Facing East quilt is 36 blocks set in 8 columns with 4.5 rows. You can find the pattern for this block in Carolyn Friedlander's wonderful book, Savor Each Stitch. The half row is is tucked at the end of my bed, so you'd never know it was a "half." With a 5" border all the way round, the quilt finishes at 94.5" x 105". It fits generously on our queen-size bed. I am so glad I decided to use a border. I don't think it detracts from the quilt at all and, boy, did it save time! I used Pineapple Fabric's color weave print for the border, backing and binding. The subtle fabric doesn't steal any attention from the understated blocks. Using a 108" wide fabric for my backing made the finishing that much simpler. Do you like the quilting pattern? This is Trumpeting Vine from our quilting design catalog. It has a slightly formal aesthetic which suits the reserved color scheme and elegant block design. I'd been weighing quilting possibilities for awhile when I realized Trumpeting Vine might fit the bill. I wanted to give the quilt a natural texture and enough quilting to enforce all that piecing, but I didn't want to add more linear designs or anything too fussy. I'm happy with how Trumpeting Vine turned out. And best of all, it's now on our bed! Finally! It feels fantastic to walk into our room and see it fitting so well and looking so fresh and lovely. Thank you for taking this journey with me. Here's to many more!